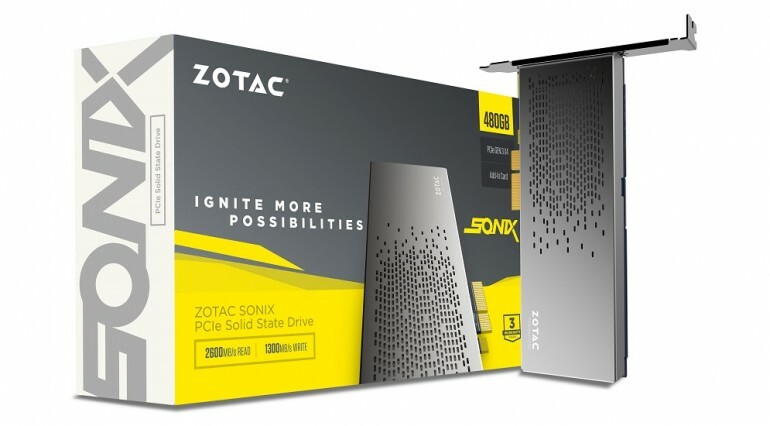 Zotac has announced a new addition in its SSD product lineup called the Sonix PCIe SSD. Being a PCIe SSD means that the storage device is capable of higher data transfer speeds compared to a traditional SATA SSD. According to Zotac, Sonix products are mainly meant for PC enthusiasts and gamers. Interestingly, Zotac only has one storage size for the Sonix SSD: 480GB. In addition to that, the Sonix PCIe SSD is equipped with 512MB DDR3 high-speed cache. This added with the NVMe 1.2 PCIe interface allows the Sonix SSD to reach sequential read and write speeds up to 2,600MBps and 1,300MBps respectively. Design-wise, the Sonix PCIe SSD is encased with a metallic black case. Bear in mind that PCIe SSDs are significantly longer compared to traditional 2.5-inch SATA SSDs. Zotac mentioned that data protection technologies such as End-to-end Data Path Protection and Dynamic Wear Levelling will ensure that consumers data is always secured. Despite being longer than SATA SSDs, Zotac’s Sonix PCIe SSD is coupled with low-profile brackets, which makes it suitable even for mini-ITX builds. Unfortunately, Zotac did not mention the price and availability of the Sonix PCIe SSD, but we do expect the company to announce both soon enough.